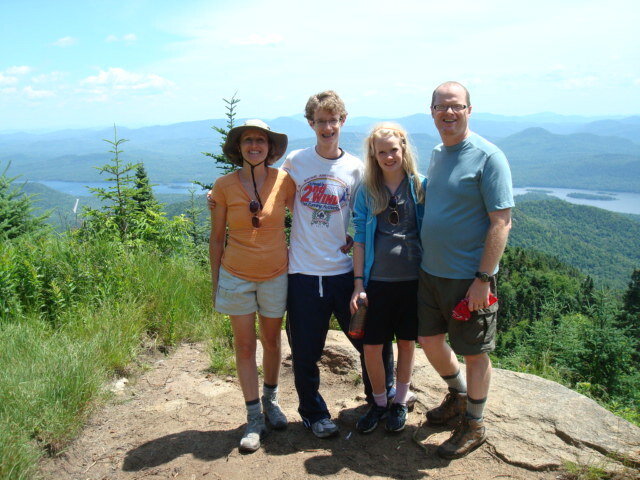 Last weekend our family traveled to upstate New York to camp in the Adirondacks. 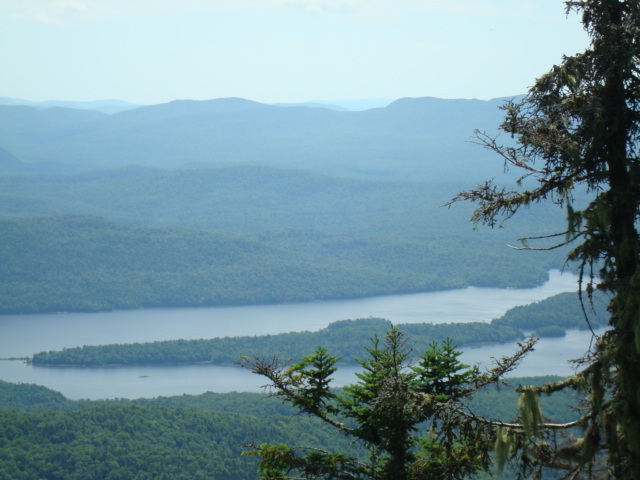 We enjoyed beautiful weather (besides an early morning thunderstorm that passed through Friday morning), several campfires, canoeing, swimming, and a hike up Snowy Mountain. It would be going too far for me to say that I love camping, but I can honestly say that I enjoyed myself very much, and camping has grown on me over the years. It’s been awhile since we have gone car camping. Yes, there is a difference. Spring Break 2011 found me carrying eight pounds of water on my back in addition to other essentials and not showering for four days while we backpacked in Big Bend National Park. So this most recent camping trip felt like the height of luxury—a warm shower every night (even if I did have to drive to the showers), plenty of hot coffee in the morning, and real food that wasn’t dehydrated. Anna was especially adamant that we car camp and not backpack—much to her dad’s dismay. On Friday afternoon as I was sitting in my camp chair in a slumped sort-of-state, Brad looked at me and said, “You look completely relaxed.” I guess I was. This got me thinking about my camping journey, and how I have learned to embrace some key qualities to an enjoyable camping experience. Two words—lower expectations. I was in my mid to late twenties when Brad and I first started camping. The thought of sleeping in a tent while it rained really bothered me. In addition, I held onto the mistaken notion that each morning I needed to get completely ready (i.e. shower, fix my hair, put on makeup). Do you know how long this takes in a campground bathroom, with one narrow shelf and warbled mirrors? This is not to say that I abandon all personal hygiene now. As I mentioned already, I showered every day on this trip, brushed my teeth, and even put on a few strokes of mascara. But I didn’t pack my hairdryer, flat iron, or other styling products, and I was in and out of the shower in twenty minutes. As for the rain, we were lucky that the thunderstorm only lasted for an hour or so and the rest of the day proved to be sunny and warm so everything that got wet quickly dried out. I knew (and so did Brad) that I reached a “ Camper Zen Moment” when the rain dripped/misted into the tent, onto me and my sleeping bag, and I simply rolled over and went back to sleep. Fifteen years ago this would have been cause for hysterics! Now, if the rain had continued all day and none of our stuff dried out, I might be writing something completely different. The key to camping success is to BE not DO. I am a doer so this doesn’t come naturally to me. I don’t know how to sit around a campfire for hours and not feel compelled to complete some task. I’m learning though, and it showed on this trip by Brad’s comment about my relaxed state. It also really helps to have two teenage children who can help with camping tasks. On Sunday, the day we left, Brad proposed that we pack up first thing, and then go to a local diner for breakfast on our way out of town. My first concern was how long it would take to pack up and how we would be starving by the time we left the campground. We pulled out at 9:30 am and were eating pancakes by 10 am. Discussions are already underway for next year’s trip. Prev Toddler Farm Singalong winner is…. In a few weeks, we will be car camping (only 1 night) for the first time with a 14 month old Peanut. We are both excited and nervous! We much prefer the backpacking style camping, but figure for a while, it will be car camping. We figure even car camping is better than no camping! Sounds like you had a lovely time. Learning to BE and not just DO is a hard lesson, but one that will pay out many times over in life. Thanks for the reminder. When I first met Mike I had one pair of shoes without heels, and I really didn’t want to get them dirty. Camping out of a “small” SUV was very different and challenging, but slowing down and ejoying the moment was life saving! Sounds like you had a great time and made good memories. My biggest struggle in life is to BE and not DO all the time. I feel I always have to be proving myself. It is so important to learn to relax into the love of God. He loves us and that is all that matters. Everything else will fall into place. Brennan Manning who wrote “The Ragamuffin Gospel” reminded me that God doesn’t just love me, but that He even likes me. What a concept! Glad your learning to BE at a young age.